TIP: Use windows copy and paste to enter the key, by highlighting the key when asked for, press CTRL-C to copy then in the serial key box press CTRL-V to paste. 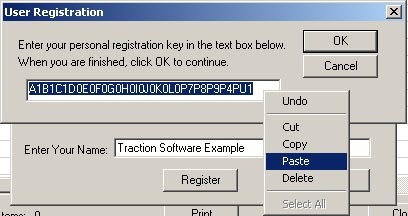 When entering or using windows copy and paste, make sure you don't have a space at the end of the serial key, i.e. always highlight the key right to left to eliminate the chance of a space at the end. Example mouse copy below, right mouse on the highlighted key then select copy to clipboard. Example mouse paste below, right mouse and select paste from clipboard. When the addon setup dialog appears click the 'Register' button (bottom left of dialog), then follow the instructions at the top of this webpage.